Along the way, readers discover what it means to boldly face any challenge, to strive after something great, and to plumb the depths of faith, fear, and desperation only to emerge changed, renewed, and emboldened. In this day and age, when the most productive thing a teenager may do is play videogames, Abby’s ambition and tenacity is a real-life parable of what can happen when we choose to exceed our own limits, embrace faith, and strive after what all the naysayers say is impossible. Having recently re-read one of my favorite books ever, Tania Aebi’s Maiden Voyage, I was in the mood for more stories of circumnavigation. I find the idea of circling the world alone in a sailboat both romantic and insane, as all the best adventures tend to be. I download samples of two books: Abby Sunderland’s story about her attempt to to a solo, non-stop, unassisted campaign was the first I read, and I finished it this morning over coffee, yogurt, and a croissant with Seville marmalade, the grey weather outside my window meshing nicely with Abby’s final days on her boat, Wild Eyes. As I’m not a parent, I can’t speak to whether or not it was the responsible thing to allow Abby to make the attempt to sail around the world. As I’m no longer sixteen (and haven’t been for more years than I care to count), I can’t speak to whether or not that age is “too young” to do things. I don’t know Abby, but I do know that her story comes across as honest, interesting, and ultimately inspiring. How many of us, after all, have Bucket Lists of things we will never do, let alone attempt? As a left-wing, liberal, non-evangelical Christian, I was concerned that the religious aspect of Abby’s story – and of her life – would be off-putting, but instead, I found her faith to be representative of what the best religion should be: supporting, uplifting, and helpful, rather than divisive. Her faith seemed to ground her, and her ability to poke a bit of fun at herself endeared her to me. So, for most of the weekend (when I wasn’t busy shopping, doing laundry, recovering from strep, cuddling dogs, and cooking), I was with Abby on her voyage. At first, the convention of having symbols to mark the changes in point of view bothered me (an anchor for the ‘narrator,’ a sailboat for Abby, and a cross for the rescue team that eventually plucked her from the middle of the Indian Ocean after her boat had rolled over and become dis-masted – and that’s not a spoiler because it was in the news), but the symbols quickly became invisible, and the switches in voice enhanced the over-all story, allowing us to experience the care and concern of the land-based “Team Abby” – which included her family, friends, and a cadre of experts – and even the perspective of the rescue team. My ultimate impression? 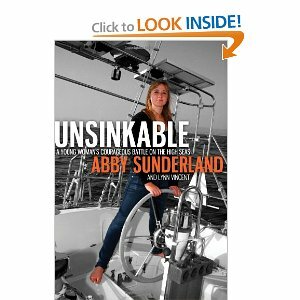 Abby is a very lucky young woman, not just because she survived a horrible accident at sea, but because she had the courage and the support to go on her adventure in the first place. Does it matter that she ultimately didn’t succeed in her circumnavigation? Not one iota. Her story is satisfying, and even after all of it, her life is just beginning. I can’t wait to find out what further adventures she undertakes. Goes well with: Hot coffee and warm croissants, especially on a cold rainy day. Review: Unsinkable: A Young Woman’s Courageous Battle on the High Seas by Melissa Bartell is licensed under a Creative Commons Attribution-NonCommercial-ShareAlike 4.0 International License.